Recording great electric guitar sounds is all about experimentation. Finding the right amp and guitar combinations that work for a particular part is just as important as selecting the best mic that suits the sound you want to capture. Australian Musician has asked some of Australia’s top music producers to share some of their experiences, techniques and tips on recording electric guitars and brotherly counter part The AMPLIFIER. Complied by Kevin Garant. Choosing the right combination Strat through a Marshall Plexi, Goldtop through a old tweed deluxe, Jaguar into a Dual Showman Reverb. Certain electric guitar and amp combinations just seem to suit particular styles of music and some combinations offer that unique magic that is embedded into our psyche known as classic or vintage guitar sounds. 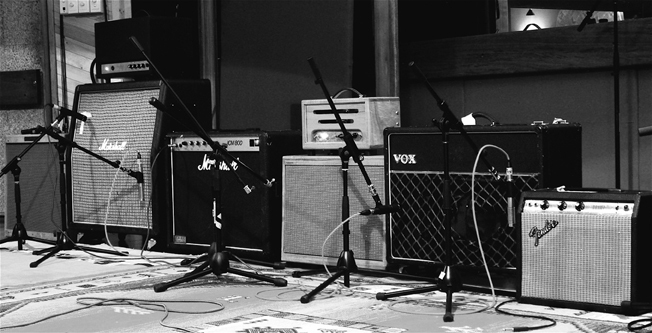 What are some of your favourite guitar and amp combinations that you have recorded? Jimi Maroudas (JM): One of my personal favourites would have to be the combo that we used on the big middle section in Eskimo Joe’s “Foreign Land”. We had a white Gibson Les Paul running through a Hiwatt Custom Studio MKII head and cab on one side and doubled with an SG running through an old Marshall head and cab on the other side. We ended up having about 4 attempts on getting that perfect sound for the middle section, partly because we were chasing that killer tone, and partly because Joel and Stu were having so much fun playing the parts! Shane O’Mara: My humble early 2000 SG special into a ‘handwired’ 18 watt Marshall, 50’s Gibson L50 [one fat p90 in the bridge position] into original a vintage Fender Tremolux. Also the same SG into a REX mascot [60’s Australian made amp], a small wattage ‘champ’ style amp that truly rocks, a 60’s Trini Lopez 335 into Vox AC30, crappy new Danelectro into Swart Space Tone – absolutely beautiful! What recordings have you used that favourite guitar and amp combination on? Do you have a go-to amp that just works on everything? Jimi Maroudas (JM): No, with amps and guitars it’s all about flavours. Different songs and even different sections within songs may need different flavours. For me, it’s all about having a great selection on hand that we can try as we go through recording each song. Shane O’Mara: No, again, the choice of amp/guitar is dictated by the song/composition. Mick Wordley: No way … but a Fender Deluxe Blackface, Vox AC-15, Vox Pathfinder, a Peavey “Delta Blues” (X1 15” speaker) are all stand outs … and of course all of those new and any old small tube amp, even RM Australian ones are always great. Colin Leadbetter: I have had more Fender Hot Rod Deluxes in the studio than I could possibly remember. I doubt they are anyone’s first choice … but they always seem to work. Have you ever had artists in the studio that wanted to re-create a classic or vintage guitar sound from old school rock records? If so how have you achieved getting that classic vibe? Jimi Maroudas (JM): We usually start with something that we think is close to the old school reference, however it’s not necessarily a case of trying to match it, rather we take the approach of ‘this guitar on this record sounds cool – how can we improve on it? So it’s always about taking it one step further, otherwise what’s the point? Shane O’Mara: You can try to use as close to the guitar/amp combination as possible, be very hard to get Malcolm Young’s scortching crunch with just a Tele and a Twin! When I go down this perplexing path, I’ll search for recording info, pictures etc. It’s fascinating and instructive, or just listen damn hard and try to ascertain the tone and then attempt to emulate it. Use pedals, different guitars, settings etc. It can be really surprising how authentic a completely unorthodox guitar/pedal/amp can sound. Mick Wordley: Use the same amps stupid! There are no limitations, especially amps … and don’t think about it too much. If it don’t sound the same off the amp, it never will and it has MUCH MORE to do with the TONE a great player can get, than technology. Listen to JJ Cale, his guitar and amp were old shitboxes, but the man could get tone from a golf club. Colin Leadbetter: No, is that weird? Do you need vintage gear to get vintage sounds? Jimi Maroudas (JM): The thing with guitars is that as the wood ages and the neck gets worn in through playing two things tend to happen, the tone of the guitar deepens and the guitar feels better to play so that is always going to be more conducive to better tone and better performances. It’s like putting on your favourite pair of old blue jeans that have worn in and stretched out to fit just right. It’s also true of amps. As they get played in, their sound develops. A great example, Charles Jenkins had this old beat up VOX-AC30 that we used on The Icecream Hands last record called “The Good China”. There’s a track on it called “Weak at the Knees” which starts with one guitar and just builds and builds. The guitar at the start is running through Chuck’s old beat up AC-30 and you can hear the rattling of the cabinet and the breakup of the speaker, but that’s what makes it for me. We couldn’t have reproduced that sound through anything else. Shane O’Mara: Absolutely not , I believe the ‘vintage gear’ thing is so overblown , when you get down to it, there are no rules. You gotta use what you have at your fingertips your smarts and your ears ! Colin Leadbetter: I don’t think so. There is a stack of great new gear around that’s based on the old designs we know and love – without the noisy circuits, earth hums and threat of electrocution. As far as a microphone is concerned, your amp is your instrument of course and Individual playing style and proficiency play the biggest part in creating great sounds, but a great microphones does help. What are some of your favourite microphones for recording guitar amps and why? Jimi Maroudas (JM): I generally go for a blend. It’s usually a ribbon and a dynamic, or a large diaphram condensor paired with a dynamic. Ribbons tends to be the Royer 121 or the Coles 4038. And dynamic is usually the Shure SM57. Of late, I’ve been getting into using the Shure SM7B, which I tend to find has a more detailed midrange. If I’m looking for punchy, I go the ribbon/dynamic combo. The low mids of the ribbons mentioned are gorgeous and the top end roll off tempers the potentially harsh top end, and the strong midrange of the 57 make for a great punchy blend. “Take the Bait” a ripping track from Stealing O’Neal’s most recent album called “Don’t Sleep” uses this combo. You might also find it interesting to know that most of the guitars on Pete Murray’s “See The Sun” were recorded with a single Royer 121 for that beautiful roll off and lo mid that I mentioned earlier. I tend to go the cardiod/dynamic pairing when I’m looking for a slightly more open and broader guitar sound. With Chris Cheney from The Living End on the track “Into The Red” from the album “State of Emergency”, I paired a Neumann U87 with a 57 on the cab and a 421 and 57 on a Vox AC30 which we had both running at once. This was used to create a broader and more open and exciting guitar sound, exactly what was needed in this instance. Shane O’Mara: I never use two mics these days. When I did, I’d always find I’d be pulling one down in favour of the other. For years I’d grab the trusty Shure 57, I then started to use a Sennheiser 609, which I still use if I need that ‘in your face’ rock sound, it just sounds ‘better’ than a 57 to me. BUT for all [and I do mean all] my recording now I use a AEA R92 ribbon, it is amazing and NEVER fails to deliver. Whack it in front of any amp, go turn it up in the monitors and there she is, the amp sound is the same, extraordinary! I’d be lost without it. Mick Wordley: I pretty much use ribbons all the time these days … AEA R-92 / Coles 4038 / Royer: R-121 / RCA 77 … always flat, no comp. Colin Leadbetter: Recently I’ve been reaching for the Coles 4038 whenever recording guitar amps. But, if someone throws a 100 Marshall and a 4 x 12 Cab in front of me, I generally throw a Shure SM57 back at them. Quad boxes, combos, practice amps, close back, open back, low wattage, high wattage … with so many shapes and sizes of amps, mic placement is always a challenge. What are some of your mic placement techniques? On axis? Off axis? Jimi Maroudas (JM): Really depends on the flavour we are going after, so it varies all the time. Shane O’Mara: With 609, usually on axis … 57, off. It depends on the amp, tone etc. You have to move those suckers around and listen. With the R96, I’ve found the placement still important but way less crucial, usually I’ll place it about half a meter or a bit closer away. Mick Wordley: I put on a pair of isolation headphones and place the mic for best resonance when the player is playing, and then fine tune when the band is playing in the monitors … real time. I haven’t ever heard a record of just guitar cabinet. Colin Leadbetter: I always start out with the mic very slightly off axis, nice and close to the grill to get things started. But I often change the mic placement to get the part being played to sit in context with the other tones in the track. Which rooms work best for guitar amps? In a closet? In a hallway? Jimi Maroudas (JM): Usually a wooden room with a bit of space, particularly in front of the amp to let it breathe and fill the space. Small spaces and highly reflective spaces tend to diffuse the energy of the amp. Shane O’Mara: I rarely use the room sound with amps, combining a room mic with close mic most times proves problematic for me. I always recorded in a small benign room. Mick Wordley: Rooms with a door are best … seriously … close miking … doesn’t make a lot of difference …. if room micing, hallways are great …. longer the better. Colin Leadbetter: I’m a fan of spaces that have a bit of character so I would opt for the hallway over the closet. What’s the craziest place you have placed a mic to get a guitar sound? Jimi Maroudas (JM): Often I’ll check other microphones that just happen to be open in the room, for example it may be a drum overhead or room mic and have a listen to see if there’s a bit of ambient magic that I can use. Shane O’Mara: Tried recording a smokey amp in a shoe box, sounded like crap. Besides a great mic there are quite a few other essential pieces of studio gear that make up that great guitar sound. Mic preamps, EQ and limiting all provide a piece in the puzzle. Do certain mic pre amps suit guitar amps better then others? Which ones do you use? Jimi Maroudas (JM): API 512c’s are excellent and are great for modern rock guitar as they are not only great sounding mic pres but very fast as well, so you capture a lot of the detail in the tone. These were used all over the guitars on Eskimo Joe’s “Inshalla” album. Neve 1073s are excellent. When we’re looking for a fatter, rounder, warmer tone. I’ll take either on guitars in a heartbeat! Shane O’Mara: I use the Chandler LTD-1 or Amek 9098, Giles VMP -2B. Colin Leadbetter: I’m a fan of the AEA TRP on the Coles 4038 Ribbon Mic. This combination can turn little amps into giants. On loud aggressive amps that I want to saturate the track, it’s an SM57 and an API 512c. What other gear do you use that completes a great guitar sound? 1176s? 1073s? Is there anything else ? Plug ins? Jimi Maroudas (JM): I generally don’t compress guitars when recording unless the dynamic is way out and compression is needed to reign it in. I like to hear the natural movement of the air created by the player, so it’s usually no compression and a little EQ, which tend to be either the API 560 or 550b’s or the EQ on the Neve 1073’s. That said, I will compress any room mics that I may have setup and usually go heavy to bring out the size of the room. Colin Leadbetter: I’ve almost always used an Empirical Labs Distressor in the signal path when recording electric guitars, not generally as a compressor but for its distortion modes and the way they colour the sound. Everything that runs through that box comes out the other end sounding slightly hotter and more alive. EFFECTED- Guitar pedals can seriously alter the sound of your amp. Gain structure totally changes when boosts, overdrive and high gain distortion pedals are added to the front end of an amp. Pedals can be used to make a little amp sound huge and a big amp melt your face. How do you use pedals in the studio? Do you have any favourites you can live without? Jimi Maroudas (JM) : One thing not mentioned that I love doing (which I guess may be considered as an effect) when recording acoustic guitars is recording it directly with a mic, and then at the same time run the signal into an amp (that is away in an isolated room) and driving the amp and recording that sound. Then blending that in. This can help lift what otherwise may be a dull acoustic sound and really make it sit in the track and drive the song. Eskimo Joe’s song “Inshalla” is a great example of this. The best pedal and by far the most important is the tuning pedal! The best bands and players tune all the time. Any time you’ve stopped and are in between takes hit the tuning pedal and tune up, guitars are notorious for going out of tune and nothing’s going to kill a great take more than it being out of tune. Shane O’Mara: I’m totally obsessed with pedals, always have been. The thought of playing straight into an amp is an anathema to me. Fuzz boxes rule my world. I have so many it’s absurd. I use pedals ALL the time, tremelo, vibrato, reverb [real spring and choice emulators], the blessed phaser etc … hard to pick favourites . Fuzz boxes? Any D*A*M fuzz box, the ‘66 fuzz is awesome, Fulltone Soul-Bender old Ibanez Standard Fuzz, Prescription Electronics Experience octave fuzz, Catlinbread Tremelo, old Boss Vibrato … too many. Mick Wordley: Usually leave them outside … a trem or a blues driver for gain structure only… maybe a Big Muff. Do certain pedals bring a dull amp to life? Shane O’Mara: Boost pedals are essential for dull amps, and they’re worth trying on any amp. I use Zvex Super Hard-On, D*A*M red rooster, Durham Mucho Boosto …Chorus pedals are BANNED at Yikesville. Colin Leadbetter: The Moogerfooger MF104Z is my go to delay pedal, not just for guitars either. I use it on everything. Problem Solving : Pickups, Noise and Extreme Pedal GainEven when using noise-cancelling pickups, electric guitars are noisy beasts especially when used in conjunction with high levels of overdrive from loud amps. What are some of your tips to reduce noise and still maintain a great natural high gain guitar sound? Gates? Plug-ins? 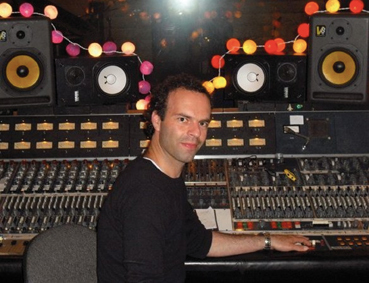 Jimi Maroudas (JM): Turning of the lights as studio dimmers tend to create interference. Finding the best place to stand in the room that also causes the least interference. I’ve even taped an electrical wire from the guitar onto the body of the guitar player to minimise the hum coming through the amp. Shane O’Mara: I rarely am bothered by the ‘natural’ hiss and hum of most amps, love hearing it on recordings. Occasionally I’ll use a gate either pedal or plug in if it’s too intrusive or I’ll record and edit it out. Send the guitarist home: Using a DI box to record a dry unprocessed electric guitar signal then later R-eamping that sound is becoming common practice but it also opens up another can of experimental worms. Hmmm, let’s send the guitarist home so the engineer is free to spend time to dial in a sound with different mic positions, adding endless effects, room sounds, different amps and on and on and … practically endless! This is a totally luxury in most recording budgets but the results are worth it. What are some of the re-amping techniques that you have worked with? Have you discovered anything? Jimi Maroudas (JM): I generally like to dial in a sound with the guitar player and have them play to that when recording, as that way the guitarist reacts to the sound he or she is hearing. How they play and dig into the guitar is influenced by what they’re hearing coming through the amp and the speakers. Shane O’Mara: I rarely re-amp guitars. Usually I re-amp other sounds through pedals and back into a pre, great for drums & vocals. I found the way the guitar part is played determines how successful the re-amping will be. I usually end up re-recording the part. What amp do you re-eamp with and have you tried re-amping other instruments through guitar amps? Jimi Maroudas (JM): Definitely, everything from acoustic guitars to vocals to most recently, sending a string section through a blazing Marshall cab! Shane O’Mara: Broadcast Passive Link into an amp/pre of desired flavour or Giles hefty Valve DI and any instrument and vocals through amps and pedals is worth experimenting with if the song requires. 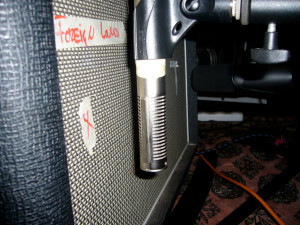 Mick Wordley: Re-amping a recorded guitar even mic’d can work fine, especially blended with the original sound. Every day is different … really !!! Colin Leadbetter: I’m not a fan of the idea of recording guitars direct to Pro Tools and re-amping them later. I don’t trust digital converters enough. But I’m a big fan of sending sounds out and messing with them. I often re-track things back through the Roland Space Echo, Fender Reverb Tank or Sans Amp Tri-OD via a Pigtronix Keymaster. There is a track on the Whitley album Go Forth Find Mammoth called Head First Down that features melody lines played on acoustic piano that we re-amped through a Moogafooger Delay pedal (which has a fantastic overdrive circuit in it) then into a Fender Hot Rod Deluxe. It sounds really saturated and harmonicly rich. 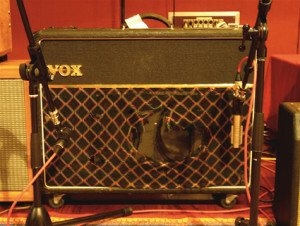 If you only could take one amp to your Desert Island Recording Studio which one would it be? Jimi Maroudas (JM): Oh really, do I have to? Um, maybe a vintage Vox AC30. But really, it all comes back to the song and the flavour you wish to use in it! Shane O’Mara: Any Swart amp … or a Vox AC15 and as many pedals as I could. Any advice for project studio on selecting a good all around amp for recording? Jimi Maroudas (JM): Go for something that moves you and excites you emotionally. If it doesn’t do that to you, then you’re greatly reducing the chance of you playing anything inspiring (even for yourself) through it. Shane O’Mara : There are so many good amps available now … I’d grab a good AC30 top boost, they’re pretty versatile. They can sound dark and they can sparkle and handle pedals really well. Mick Wordley: No $$$$? A VOX Pathfinder 15 ….. no brainer. Plenty of $$$$? A re issue Fender Deluxe. Colin Leadbetter: You don’t need a big amp to get a big sound.